Located in central Chile, north west of the capital Santiago, the historic port city of Valparaiso was once the most important merchant port on the Pacific trading routes of South America. 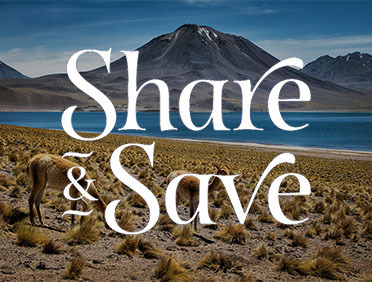 Now it’s a UNESCO World Heritage Site offering some of the best in Chilean food, art, and culture waiting to be discovered. A vibrant city with a bohemian vibe, Valparaiso is rich in theater, music, performance and street art— most streets, staircases, alleyways, and buildings are brightly painted. 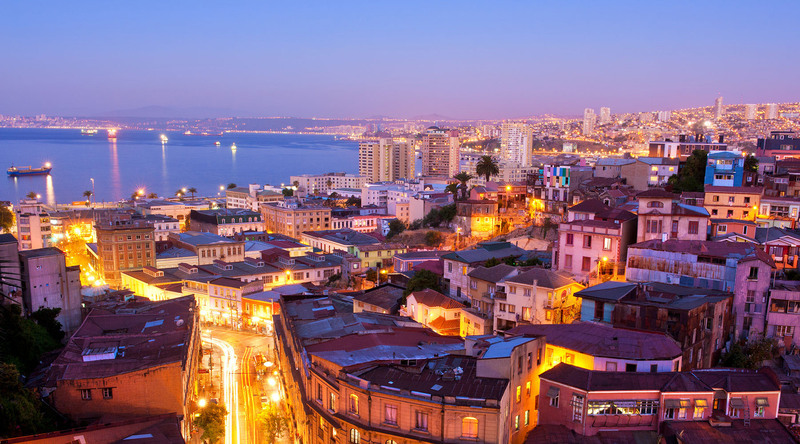 Valparaiso is also full of exquisite Victorian architecture, boutique stores, and spectacular views of the bay from just about any vantage point. You’ll quickly understand why Valparaiso is known as ‘Little San Francisco.’ Its greatest charm is the close proximity of exciting, engaging attractions at every turn and on every hill. Stroll winding cobblestone labyrinths of alleyways and bustling streets, quaint shops, and beautiful, brightly-colored houses on the hills. If the walking gets tough, let a reliable funicular railway (built in the late 19th and early 20th century) carry you up the steep hills, a popular way to avoid the climb and get incredible views of the city, port, and Pacific Ocean. Be sure to try the traditional Chorrillana, a pile of French fries topped with steak strips, fried onion, and fried egg. Chances are, one order will be enough to share. The most famous place to try this local delicacy is J Cruz, a traditional Chilean restaurant with a few locations in the city. The bustling Mercado Cardonal, a farmers’ market in the eastern part of the city, offers produce as colorful and diverse as Valparaiso’s landmarks and culture. And the Mirador (lookout) Diego Portales offers what might be the best vantage point to see every hill of Valparaiso. The Naval and Maritime Museum honors and highlights Chile’s naval history and features a wide range of ship artifacts, illustrations, and models (plus another amazing inland view of the city). La Sebastiana, the former home of famed Nobel Prize-winning poet Pablo Neruda, is a quirky, must-see attraction. Take an audio self-guided tour, enjoy 360-degree breathtaking views of the city, and learn about this legendary artist’s work, eclectic collections, interests, and life. Just north along the coast are the huge Dunes of Concón, which can be seen across the bay from Valparaíso on a clear day. For incredible views from a desert next to the sea, these are a must-see. Add in some exhilaration by renting a sandboard on-site and cruising down the hill along the shores of the Pacific. Built in the early 1800s, this former garrison (then later, city prison) is now a cultural, social, and artistic hub with a large theater in the center of the city. Enjoy exceptional murals in what used to be exercise yards, plus various visiting art exhibits, classes, and live theater and dance performances. One of Valparaiso’s most famous hills (cerros) and neighborhoods. While the city includes dozens of unique hills, Cerro Concepcion’s central location and colorful graffiti, murals, painted staircases, architecture, churches, unbeatable harbor views, plus its many shops and cafés, put it at the top of the list of incredible Valparaiso experiences. Journey into the fertile Casablanca Valley where you'll visit a pair of local wineries for an immersive and quite delicious look at local viniculture. Embark on a fascinating journey that takes you through the streets of Valparaiso, revealing its artful history and days as a major 19th-century seaport. Enjoy a leisurely panoramic journey through the UNESCO World Heritage city of Valparaiso and the beautiful coastal resort of Vina del Mar.